The Fregatidae include five extant species, which occur in tropical and subtropical oceans worldwide. Frigatebirds are highly aerial birds and can neither walk on land nor swim. The only Paleogene fossil records of the group are two species of the taxon Limnofregata, which were found in the early Eocene Green River Formation (Olson 1977a; Olson and Matsuoka 2005). Limnofregata azygosternon Olson, 1977 and L. hasegawai Olson and Matsuoka, 2005 mainly differ in size and the proportions of the beak. Both species are known from several articulated skeletons, some of which exhibit feather remains. The smaller species, L. azygosternon, was about the size of the males of the Lesser Frigatebird (Fregata ariel), which is the smallest extant species (Olson 1977a). Limnofregata shares a greatly abbreviated tarsometatarsus, a triangular deltopectoral crest (humerus), and a short and wide pelvis with crown group Fregatidae. However, despite a similar overall morphology it distinctly differs in several presumably plesiomorphic features. Among others, the beak of Limnofregata is shorter and its tip less strongly hooked, the narial openings are long and slit-like and not greatly reduced as in extant Fregatidae (juvenile frig-atebirds still have slit-like narial openings; see Fig. 9 in Olson 1977a), the hind-limbs are proportionately longer, and the coracoid is not fused with the sternum and furcula. Olson and Matsuoka (2005) further assumed that, in contrast to modern frigatebirds, Limnofregata was not sexually dimorphic in size. 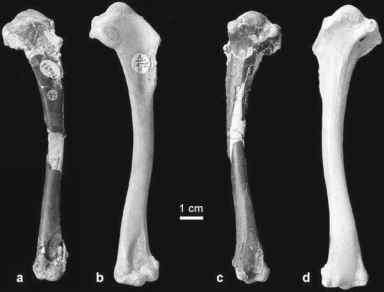 Whereas extant frigatebirds are pelagic birds, the Limnofregata fossils were found in lacustrine deposits. According to Olson (1977a) and Olson and Matsuoka (2005), these Eocene frigatebirds may have occupied an ecological niche similar to that of extant Laridae (gulls).